Learn to Dive the best way with our PADI Open Water SCUBA Diver course! Wow! Scuba Diving… imagine.. Underwater… Breathing… Another World is waiting for you right here in New South Wales! The PADI Open Water Scuba Diver course is your ticket to the underwater world, and no better place in NSW to learn than, at Jetty Dive. Get your PADI Here! What will our PADI Open Water Scuba Diver course let you do? The PADI OPEN WATER SCUBA DIVER course will give you the ticket to SCUBA Dive anywhere in the world. After you are certified, you will have the skills to Scuba Dive without supervision! You won’t need a Instructor to lead you. Our training involves equipment that is used in cooler water, learning Scuba skills with our high level of training will make tropical diving so easy as well! Learn to Dive with Tropical and Temperate fishlife! Northern New South Wales has warm water like the southern Great Barrier Reef, but still has some influence of the cooler waters. The Solitary Islands are loaded with Fish from both worlds. When can I Start my PADI Open Water Scuba Diver course? START TODAY! * It takes 3 Days plus the Theory using either PADI E-Learning, PADI Open Water Touch (IPad and Android based theory) or home study using Textbooks…. or make it a 4 day PADI Open Water SCUBA Diver course with the theory taught by our PADI Instructors, using our classroom. Yes, contact us for your PADI E-learning code and Log-in and START TODAY! Not always able to go online? You can use the PADI Touch theory (IPad and Android) or the PADI Textbook (both PDF and paper copy) to start the Theory now too! The 3 Day Practical part of our PADI Open Water SCUBA Diver courses are run regularly, weekends and Weekdays starting on demand. (minimum numbers apply) The courses are flexible, so you can do it on weekends Private SCUBA courses start anytime! When do we SCUBA Dive in the Solitary Islands Marine Park? Whenever the boat runs you can be learning to SCUBA dive in the best sites of the Solitary Islands Marine Park! This part of New South Wales has tropical and sub-tropical fishlife. You get to see thousands of fish from both worlds! How much is the PADI Open Water SCUBA Diver course? PADI Open Water SCUBA Diver course…… $595.00.. per person..
*The Bonus $50 pays your $50 deposit on another dive with us or $50 towards your next course, the PADI Advanced Open Water Diver course or $50 off a mask and snorkel set (must be taken or arranged at time of course). If using our Classroom theory method, you start your course learning all the theory in one day before Day 1 of the Practical. If you choose PADI E-learning, PADI touch or Home-study, you need to complete this before Day 1 of the practical. Once your PADI E- Learning or theory is complete..
Day 1 Start your SCUBA Diving! The fun begins in the Pool with all your SCUBA skills and orientation of Scuba Diving. We also show you the gear, what to choose or not choose, and what is right for you. You start at 8.00am at the shop. Day 2 It’s on our Dive Boat for Open Water Dive 1 and 2 at the Solitary Islands Marine Park. You will do some skills assessments, but most of the dives you will be looking at the amazing fishlife of the New South Wales north coast. Our half day Dive charter trip start at 7.30am at the shop. Day 3 It’s back on our Boat for Open Water Dive 3 and 4 at the Solitary Islands Marine Park. You will have some more skills on Dive 3, but Dive 4 is all fun and practicing your own dive plan. Starting again at 7.30am. After the paperwork is done, You are a certified PADI Open Water Diver! You will see how learning to dive is fun at Jetty Dive Centre, diving the best that New South Wales can offer! What’s Included and Good about Our PADI Open Water SCUBA Diver course ? The BEST SCUBA Dives!! 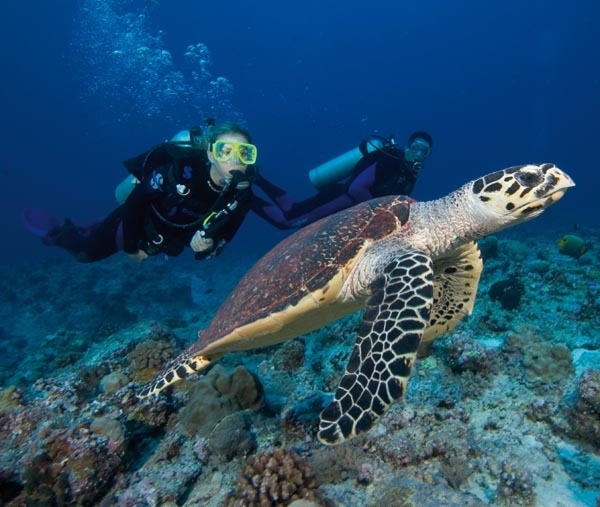 This SCUBA Course includes Four Great Dives at the Solitary Islands Marine Park! We may not be the cheapest course because 4 boat dives are included, NOT low cost shore dives! We SCUBA Dive in Small Groups, usually 4, but no more than 6 per SCUBA instructor. Our SCUBA training Pool Sessions are Very Thorough and a lot of Fun! You get a PADI 5 Star Open Water Certification Card and Wall Certificate. We believe in looking after our oceans, so every diver we train includes a Donation to Project Aware with a Special Project Aware Divers Certification Card for you. The ability to swim 200 metres or snorkel 300 metres (with mask, snorkel and fins), and stay afloat for 10 minutes is required. You need to be healthy and Medically Fit to Scuba Dive. Medical Considerations Prior to starting a PADI Open Water Scuba Diver course, you are required to complete a Divers Medical questionaire. If you have any medical conditions that are listed in the Medical Statement, you are required to complete an approved Scuba Diving Medical Certificate (AS 4005.1) with a Medical Physician. You can download a copy of AS4005.1 Medical Form here. Booking Conditions… the fine print! Bookings require a $100.00 deposit per student. When using PADI E-Learning, it is recommended that a Medical Statement is done before you start as the Padi E-Learning component is not refundable if you fail the medical requirements. No refunds will be given if the customer cancels within 48 hours of the course start date. Why learn to dive at Coffs Harbour? The Solitary Islands Marine Park is where the Tropical Fish from the Great Barrier Reef meet the huge schools of fish from Temperate waters. You can see Nemo and Dory along with the friendly Grey Nurse sharks, rare Black Cod and Turtles, there is so much to see. The Solitary Islands dive-sites are offshore! Close enough to be a quick trip and yet far enough to get clean, pristine water which you can’t get inshore. You may even see Whales in season, on the way! The Solitary Islands Marine Park is Pristine! We have vibrant corals and over the top, wall to wall Fish! We dive in Marine Sanctuary Zones that are just action packed. It may be just your boat out there! There is no crowds, like the larger boats at the Great Barrier Reef. It could be just you or your small group learning to dive! The water temperature is the same as the southern Great Barrier Reef, not to cold, and with our wetsuits, great for all year round. Genuine quality PADI courses. We teach in small groups and make sure you have the training and skill to dive anywhere in the world. What is the Solitary Islands Marine Park? “Coffs Harbour is the Gateway to the magnificent Solitary Islands Marine Park. The Islands are magnets for the mixture of fish from the Barrier Reef and the Southern Ocean. They all meet here! It truly rivals the Barrier Reef for the variety of fish and corals (Yes we have them too!) IT BEATS the Barrier Reef for the volume of fish that are in the Sanctuary Zones we dive in. The shore diving is not as spectacular as the Island diving, so Jetty Dive Centre offers boat diving at the Solitary Islands only, for all of our PADI courses. Whilst the cost of a course is reasonable and not the cheapest, the diving is nothing short of spectacular and worth every cent! Check out this cool video from PADI and see why we love Scuba diving! PROUDLY A PADI 5 STAR DIVE CENTRE for over 20 Years! The only PADI 5 Star Dive Centre on the Banana Coast at Coffs Harbour, in fact from Foster to Byron Bay on NSW’s north coast! Hey we’ve been here on the Coffs Coast longer than that! We are proud to be PADI Centre for 20 years! And a Dive Shop for over 35 years!